November | 2015 | seedLinG! Every year, for the past four years, Cortland Preschool, with the help of Mary Artibee and Milt Mallory, our families, friends, and Cortland community members, has provided full and partial scholarships for families with financial need. Recipients are always kept confidential, but sometimes a family will opt to share a thank you with the community upon graduation. “Our family has been blessed to be a part of the Cortland Preschool community for almost two years. It’s been a time of emotional and physical growth for Abel, as well as growth in our family size! When Abel started, he was an only child. Within a few months of starting preschool we got a call and 7 month old baby Ricky joined us the next day. Within a year, 8 month old Amari had joined us as well. I mention this to emphasize that while there were enormous changes at home, one thing was consistent for Abel: his beloved school. All of the teachers and parents were so kind during that time, reaching out to make sure we had what we needed and making sure Abel was feeling adjusted and getting a little extra attention. He has handled these big adjustments with so much grace and I know a lot of that has to do with the support system around him. As a single parent by choice through adoption and foster care, there are obviously a lot of careful budget decisions and sacrifices made. Abel’s schooling, thanks to a very generous scholarship from Cortland, has not had to be one of them. He has thrived at Cortland. I see a real change in his confidence and empathy toward others. Thanks to his preparation at Cortland, he is truly ready to head to his “big nest” at Kindergarten. 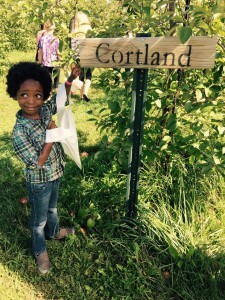 Thank you, Cortland community, for supporting diversity in our classrooms. Thank you for caring when families need help the most. And thank you for making excellent education something for everyone, not just some. We hope you will bid in our current fundraiser, the Online Student Art Auction, which runs until November 30, 2015.